The United States pioneered military drones for surveillance and then missile strikes in Afghanistan nearly two decades ago; only a handful of states now have those capabilities. But small, commercially available drones of the kind Venezuela says were used in the attempt have proliferated widely among private actors in recent years. They do not require billions of dollars to procure or runways to take off. They can be used for filming or for delivering commercial products or humanitarian aid. They can just as easily carry explosives. The attempted target in Venezuela was new, but the risk was not, nor is the anxiety among analysts and officials that it’s only getting worse and that countries, including the United States, are unprepared to deal with it. Only months after the Islamic State took the Iraqi city of Mosul in the summer of 2014, there were reports that the group was flying surveillance drones. The fall of 2016 brought the first known instance of fatalities from a suspected ISIS drone, when two Kurdish fighters in northern Iraq were killed examining an explosives-rigged drone they had shot out of the sky. At the peak of ISIS drone activity in 2017, according to a report from the Combating Terrorism Center at West Point, its drones were flying dozens of missions a month across Iraq and Syria, with one Syrian Defense Force soldier reporting repeated drone attacks on logistics lines and and ammunition depots. This technological evolution is typical of terrorist groups’ tactical innovations, which often involve devising low-cost ways to inflict disproportionate damage on a stronger enemy. It’s easier and cheaper, for example, to rig and hide a simple explosive device along a roadside, as various insurgent groups did to devastating effect in Iraq, than it is to find and disarm them, or protect personnel against them. Similarly, al-Qaeda, ISIS, and others have turned everyday technologies—from pressure cookers, to vans, to airplanes—into weapons of war. Commercial drones are just the latest example of a longstanding pattern. While ISIS’s drone activity has declined with its loss of territory in Iraq and Syria, the problem is not limited to them, nor to the world’s battlefields. In 2015, Reuters reported that a protester flew “a drone carrying radioactive sand from the Fukushima nuclear disaster onto the prime minister’s office, though the amount of radiation was minimal.” Mexican cartels have used drones to smuggle drugs and, in one instance, to land disabled grenades on a local police chief’s property. Last summer, a drone delivered an active grenade to an ammunition dump in Ukraine, which Kyle Mizokami of Popular Mechanics reported caused a billion dollars’ worth of damage. Jaz Banga, the CEO and cofounder of Airspace, a firm that works on air security to counter rogue drones, said “there’s really no comprehensive protection right now across the U.S.” Drones have to be registered to fly—and attach identifiers akin to a license plate—but it can be difficult to discern them in the air. Like the drone that crashed on the White House lawn, they can be too small or too low to spot with radar. And though the technology now exists to identify who is operating a commercial drone, drone operators are not yet required to use it. 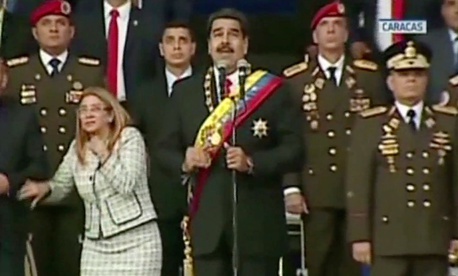 In the event that a rogue drone is detected, it’s generally illegal to shoot it down; ditto with jamming the radio or WiFi signal controlling it, as the Venezuelans apparently did. And if law enforcement did so anyway, it could pose risks to civilians on the ground. The Federal Aviation Administration is working on rules to require identification; other defense measures would require changes to the law.